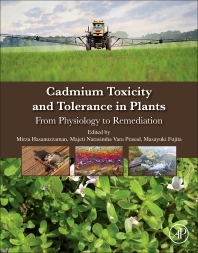 Cadmium Toxicity and Tolerance in Plants: From Physiology to Remediation presents a single research resource on the latest in cadmium toxicity and tolerance in plants. The book covers many important areas, including means of Cd reduction, from plant adaptation, including antioxidant defense, active excretion and chelation, to phytoextraction, rhizo filtration, phytodegradation, and much more. In addition, it explores important insights into the physiological and molecular mechanisms of Cd uptake and transport and presents options for improving resistance to Cd stresses. It will be ideal for both researchers and students working on cadmium pollution, plant responses and related fields of environmental contamination and toxicology. Prof. Dr. Masayuki Fujita, Laboratory of Plant Stress Responses, Faculty of Agriculture, Kagawa University, Japan – He is expert in Plant Stress Physiology, Plant Biochemistry and Molecular Biology. Published 50 book chapters and more than 80 research articles.